Air screwdriver. Buyers are more than welcome to purchase our products and we provide techniques, sales resources and excellent after sales service. 1. 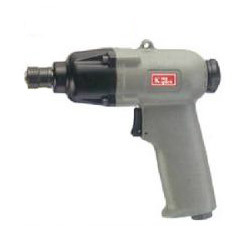 Bolt capacity: 15/64" ~ 5/16". 2. Net weight: 2.53 lbs (1.15 kgs). 4. Avg. air cons. : 3.89 cfm (110 l/min). 6. Hose size: 1/4" (6.3mm). 8. Max. torque: 534 in-lb (61 N-M).